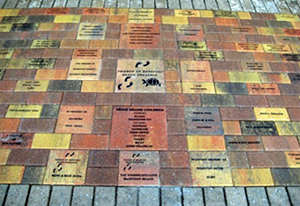 Any type of organization, large or small can succeed with engraved brick fundraising. Community members, friends, family and more will be eager to buy pavers in support of your worthy cause! Call us and PAVERART will help get your program started. It is easy for us to make your engraved fundraising project unique & highly profitable. Polar Engraving offers free engraved brick samples, featuring your own text and/or logo. Your sample brick can be engraved and shipped within one business day. 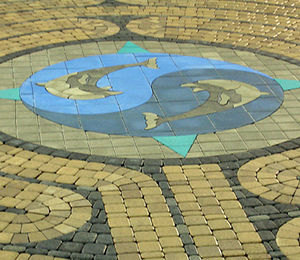 PAVERART is an innovative design and manufacturing firm that specializes in the creation and manufacturing of artwork for the interlocking paver medium. 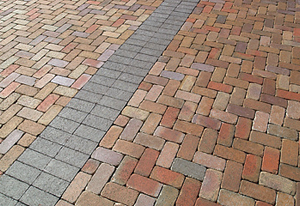 We recognized that limited design options were available to consumers and project designers who wanted to beautify and distinguish their paver projects. PAVERART developed a new, patented process whereby intricate and durable designs could be manufactured for easy installation into a field of pavers. To achieve its vibrant and durable images, PAVERART uses only high-quality, concrete colored pavers which are manufactured using a pigmentation process. No paints or stains are used to create our artwork. Our designs, large and small, have been installed throughout the United States – from the Flamingo Hotel in Las Vegas to the Camden Aquarium in NJ to private homes in Florida. Welcome to Polar Engraving, a family owned business founded in 1998, specializing in successful fundraising brick campaigns. Polar Engraving creates custom engraved bricks, commemorative bricks, and fundraising tiles to help you achieve a winning fundraiser. Polar Engraving will help you for the life of the fundraising project, like choosing a brick color or finding brick colors to match other bricks on your site. Likewise, Polar Engraving's skilled marketing team will help you advertise your fundraising brick campaign with many promotional ideas. Our team is always available to answer your questions about brick engraving. Founded in 1891, Acme Brick Company has a proud history of quality brickmaking. Quality and service have made Acme Brick the nation's largest American-owned brickmaker. Acme's solid clay paving brick are hard-fired in computer-controlled kilns at high temperatures to fuse the clay particles for maximum strength. This hard-firing creates rich, natural colors that are impervious to ultraviolet radiation, which often causes artificially colored concrete pavers to fade. Additionally, the clay paver surface is stain-resistant. Acme Brick also offers engraved pavers, enabling you and your group to make a lasting, personal contribution to any building project.